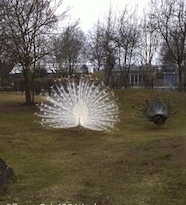 He struts into the room, preening like a peacock. It’s mean but I can’t stop myself from laughing. I wipe away tears and compose myself. One of my photos is the prompt for FFfAW this week. Looking forward to everybody’s stories. < Previous One More Time? LOL! Cute story! Loved the twist at the end. 🙂 I enjoyed reading this story! Thanks, PJ – glad you liked it! Thank you for the beautiful photo prompt! Lovely take on the prompt with a nice ending. Nice dialogue! That was a very nice take on the prompt. I really enjoyed reading a story about a wedding, which was entirely unexpected for me anyway! A very funny short scene. Most people can’t really pull off an all-white suit. Love this! Great sense of humor and perfect ending. Good on him for dressing up in white, if she doesn’t he’ll do it instead. Love this take on the prompt! Yay for non-traditional brides! Great story. And now I’m wondering what color she is wearing. Fun story. amusing as always! I would love to see him dancing down the aisle to “staying alive”! What a wonderful take on the prompt!! !